Fashions for teens and small women, January 1926. Butterick patterns illustrated in Delineator, bottom of page 27. One year later, young women were wearing their dresses much shorter, and fashions looked more youthful because of a subtle change in proportions. Day wear for teens (15 to 20) and small women, January 1927. Butterick patterns in Delineator, page 24. I see knees. When looking at designs from 1926, we need to make allowance for the exaggerated length of the 1926 fashion [illustration] figure. Fashions for teens and small women, January 1926. The proportions of the 1926 dresses have been altered near the waist in this image, not at the hem. I just cut and pasted the lower part of the 1926 dresses higher on the body. Left, original illustration; right, with the lower half of the dress moved higher on the torso. The result is also a more realistic human figure. 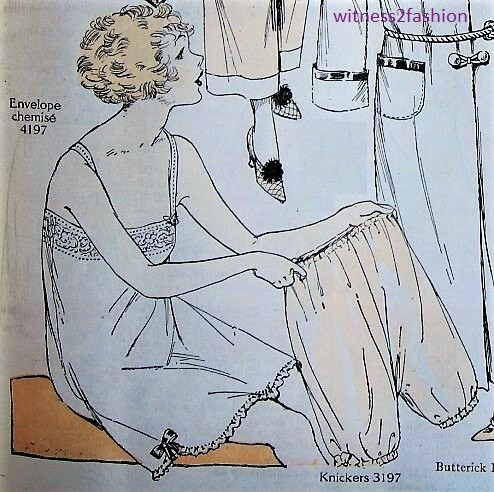 The fact that many late Twenties’ dresses had a horizontal seam at the mid-hip must have made it much easier to restyle 1926 dresses into 1927 dresses! The skirt portion of a 1926 dress might be cut off below the waist and sewed to a shorter bodice to become the skirt of a shorter 1927 outfit…. Or she might shorten the dress three or four inches at the 1920’s dropped waist level and cover the resulting seam with a belt…. This dress from January 1927 was altered at the waist while still in the pattern stage, but that belt could also cover a dress alteration…. I suspect that, when skirts got shorter in 1927, many “little dressmakers” must have been busy doing simple alterations like these. A little girl communicates with her “Paw Pa” through an ear trumpet. Family photo. It’s time for my annual reminder to keep a box of unidentified family photos and an acid-free pen or a pencil at hand for the quiet moments at family gatherings. If you think you’ve heard all the stories before, consider that now that you are fully adult, seniors may be willing to tell you things they wouldn’t speak of when you were a child: failed marriages, lost loves, siblings who died young or were never mentioned for some other reason. (I certainly learned some surprising things when I asked as a adult!) Perhaps there is a terrific story behind one of those faces. Besides, sometimes the stories are funny — and just waiting to be told when the time is right. Today’s photos come from a side of my family I never knew. My aunt Dorothy’s husband, Leonard H. Holt, died suddenly a short time before I was born. My uncle Leonard Holt, serving in World War II. Dorothy, Holt, and Dorothy’s mother. Redwood City, CA, about 1919. Dorothy is dressed in hiking clothes, and Holt is wearing “civvies” although he served at nearby Camp Fremont, an Army training camp during the First World War. L. H. Holt standing in front of a Southern Pacific Railway building in San Francisco. Picture dated 1923. Dorothy did tell me that Holt was very particular about his clothes, and had his army uniforms tailored to fit well. Look at his elegant shoes! After Dorothy died, I found some of Holt’s silk shirts (with white French cuffs and made for a detachable collar) stored in the cedar chest that once held her wedding linens — a “hope chest” as unmarried girls called them. Holt’s shirts were beautiful, in soft pastel colors or stripes that epitomized the Arrow Shirt man’s look. I think they were married about 1925. In 1930, Holt was still in the Army, and the couple lived on the Presidio, a beautiful Army base in San Francisco. Dorothy and Holt vacationing in the snow, early 1930s. In spite of war-time travel restrictions, Holt’s nephew (?) Jody Holt (serving in an Army band at the time) was visited by his sweetheart “Miss Meek” and his mother (?) Sally Holt, in San Francisco. 1945. Holt died of a heart attack not long after this happy family visit. Mack was still alive, and his new home was much larger. The great thing about photos exchanged by mail is that they are often labeled or signed, including long notes on the back — a treasure for genealogists. Many of these children are Leonard and Dorothy’s nieces and nephews. The back of the picture is full of information. The back of a photo of many Holt family children. It tells us that Holt’s sister Nina had five children, and that his sister Gertrude had children (one called Hickie) and grandchildren. I don’t know who Estelle was, but that’s a trail to follow. This photo is so old that is has cracked, but luckily the faces and their names are intact: “Leonard’ s Father The Holt Boys John & Mahlon Holt.” JH is on the right. Unfortunately, not all the pictures mailed from Tennessee are labeled. All I know about this couple is that they were photographed in Pulaski. Is this the same mustached man who appears far right in the large group photo below? Perhaps there are folks in Pulaski, Tennessee, who will recognize their ancestors in this large, undated picture. (It’s 7.5 x 9″) I’d be happy to send it to someone who’d treasure it. Studio photograph of the Holt family of Pulaski, Tennessee. There are no names on the back, but I think I recognize John Holt, standing 2nd from right, from another photograph. (He died in 1904.) I believe one of the young boys is Leonard H. Holt. The woman seated center in this photograph appears to be wearing a mourning hat and black veil. Detail of woman in widow’s cap. Could the man seated in front, with a large mustache, possibly be this mystery man, photographed with both Holt and Dorothy, probably in the 1920s? Unknown man with very large mustache, standing with Leonard H. Holt, probably at the Presidio in San Francisco, probably 1920s. Mustached mystery man with Dorothy Barton Holt, probably at the Presidio in San Francisco, and, judging from her clothing, in the 1920s. I believe this man was a visiting relative — there are many pictures of him. I could easily believe he’s from Tennessee….